James Gilpatrick Blunt was born in Maine in 1826. Moving to Ohio, he attended medical school and began practicing medicine in 1850. Blunt relocated to the Kansas Territory in the fall of 1856 and became involved in the struggle to help make Kansas a free state. In the fall of 1857, James H. Lane was placed in charge of the free-state militia by the Kansas territorial legislature and named Blunt to his staff of military aides. Blunt played an active role at the Wyandotte Convention which ended up drafting a “free-state” constitution. This constitution was approved 2-to-1 by the Kansas voters and became the present Constitution of the State of Kansas. Early in 1861, Lane appointed Blunt as lieutenant colonel in the Third Regiment second in command to Col. James Montgomery. In April 1862, Blunt was promoted to brigadier general and placed in command of the Department of Kansas. In September 1862, Blunt was defeated by Confederate forces at the First Battle of Newtonia. That November, Blunt led about 5,000 troops to prevent the occupation of the Cane Hill, Arkansas Marmaduke's Cavalry Division. In December, Blunt teamed up with the forces Brig. Gen. Francis J. Herron to defeat Confederate Maj. Gen. Thomas Hindman at Prairie Grove, Arkansas. As a result of these victories and press publicity, Blunt was promoted to major general in March of 1863. Blunt returned to command the District of Kansas in 1863. His tenure was marred by depredations performed by the “Kansas Red Legs,” pro-Union guerrilla forces. During a reorganization of the Department of the Missouri, Blunt was named to command the District of the Frontier, during which he became involved in the corruption that was rampant throughout Union installations in the Trans-Mississippi Theater. In the fall of 1863 on his way to Fort Smith, Arkansas, Blunt had a chance encounter with Quantrill’s raiders near Baxter Springs in the Indian Territory. His small force was overwhelmed and he just barely escaped with his life. The “Baxter Springs Massacre” was a black mark on Blunt’s record and cost him his command. 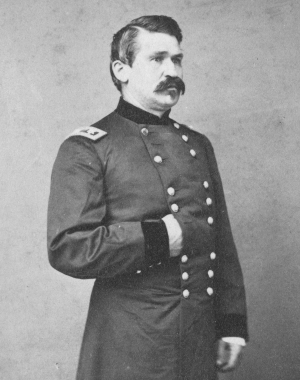 But in January 1864, Blunt was reappointed to command the District of the Frontier because of support from Lincoln. Blunt commanded a cavalry division during Price’s 1864 invasion of Missouri and Kansas, fighting at Lexington, Little Blue River, Big Blue River, Westport and Newtonia. Blunt resigned from the army on July 29, 1865. He was 39 years old. He moved to Leavenworth, Kansas and resumed his medical practice. He was admitted to the Kansas Bar. He moved to Washington, D.C. in 1869 and practiced law. In the late 1870s, Blunt began to act irrationally and was committed to an asylum in 1879. Blunt died in 1881 and is buried in Mount Muncie Cemetery in Leavenworth, Kansas.